Porgera is a small mining town in the Enga Province of Papua New Guinea. Porgera is welknown not only because of the mining prospects in the area but also the fashion of rugby League the people have in the area. Porgera has produced some of Papua New Guinea's national rugby league players called Kumuls. The main team that represents Porgera is called Porgera Nuggets. It takes its name because of the gold nuggets that drives the econonmy of the area and also the country of Papua New Guinea. Porgera has been fighting ever since its formation to place a representative team in the semi-profesional league (now called Digicel Cup because of its sponsor). 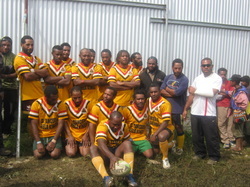 The Porgera Nuggets Rugby League team has participated in the Cairns Far North Queensland Sporting and Cultural event known as the All Blacks Rugby League carnival in Cairns. The Porgera Nuggets last participated in 2010 and lost during the second elimination to Cherbourg rugby league team by 4 points to a local Aboriginal community south of Townsville. Porgera Nuggets is the only international team accepted by the elders of Kungayi Clan of Yarrabah in Cairns as their brothers under their banner to participate in the event formally known as Jack Ahmart Shield. The Cairns All Blacks is identified as a modern day corroboree where the event brings together Aboriginal and Torres Straight Island people from across the state of Queensland but instead of showcasing through dance, it is showcasing through sports.